You can find the review of ‘Wool’ – here. 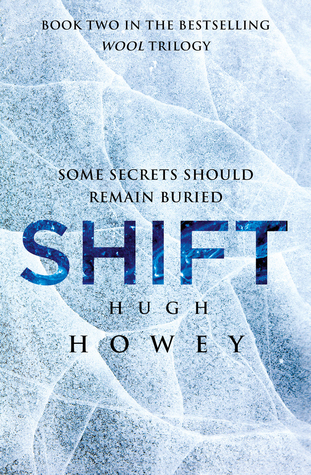 Shift Omnibus Edition (Shift 1-3) (Silo Saga) is prequel to best-selling post-apocalyptic ‘Wool’ series by Hugh Howey. Before starting with the review for Shift (1-3), let me tell you, I liked all the ‘Wool’ books very much and gave them very high rating – Reason being ‘the whole Wool series was very innovative and story and settings were very unique and interesting’. Each book tells a story which will eventually be linked to the events happened in ‘Wool’ series. The book one, i.e., First Shift is mainly focused on how and why the silo’s built and reason behind the man made apocalypse. Two stories run parallel in book one – first one in mid 21st century where it is focused on building of ‘silos’ and second one in ’22nd century inside silo one – where a guy named ‘Troy’ is taking controller of Silo 1 who is woken up from deep freeze after 50+ years and Silo 1 controls all the silos’. Now coming to problems with story – I ask where is innovations? Didn’t Hugh Howey saw the movie ‘The Day the Earth Stood Still’? If yes – he should have known that the concept of ‘Nano machines’ destroying the world and humans was already being told in this movie. Though the only difference between book and the movie is – in movie the ‘Nano Machines’ where bought from aliens to earth and whereas in ‘First Shift’ – Israel built it first then Iranians copied it and made it more ‘DNA’ centric – means it will attack only on certain DNA types (like ‘Jews’ etc) and left them lose on Americans. Some guys in US government found out about this (like they found nano machines in almost everyone’s blood in US) and developed cure also but instead of curing the people – they built 50 Silo’s for each state of US and nuked whole world – where’s is the logic? If you have the cure then why nuke everyone? And ‘Second Shift’ and ‘Third Shift’ – similarly deviled into two different story line: in both the story one story line is focused on ‘Silo 1’ and second story line revolves around ‘Silo 17’ and ‘Silo 18’. I found the story of ‘Solo’ in Silo 17 is totally unnecessary and pretty boring. By the end – we come to know that the world outside is green and habitable – when our main protagonist ‘Donald’ fires a drone to check world outside – and it is finally revealed that the ‘Nano Dust’ is surrounding the only limited area (i.e., the area surrounding fifty silos) behind that the world is green and habitable. I ask ‘What the hell – they were doing in Silo for almost three centuries?’, ‘Why didn’t they checked before – whether the world is habitable outside the surrounding area of Silo?’, ‘Are they so dumb?’. All three books in Shift didn’t add much to the ‘Wool’ events – most of the things you already know from Wool. All three novels are pointless and you can avoid them – they are not going to add much to the ‘Wool’ series. The idea/plot of all three books doesn’t’ make any sense and the book itself is too big and boring. The story which is set in 2049, but it feels like 2000 because the technology, specially touch screen computers are non-existing and no one is using ‘Twitter or Facebook’ or any amazing replacement – the social media is dead in 2049 as per Hugh Howey. The only things which makes it 2049 is Nano machines. Even the ‘technology/challenges’ faced in building Silos and the working Silos didn’t actually explained in all three novels? Where is the part which explains – how the oxygen supply is provided to 150 storey building? How electricity is generated underground? How water is being provided? And the logic explained for cleaning doesn’t’ make sense at all! Overall – Shift Omnibus Edition (Shift 1-3) (Silo Saga) is pretty boring and repetitive narration of rebellion sequence of ‘Wool’ makes it even boring. No innovative story line even the Nano Machines part seems like taken from movie ‘The Day the Earth Stood Still’. So, My verdict is you can avoid it.